This is an intense ascendant. 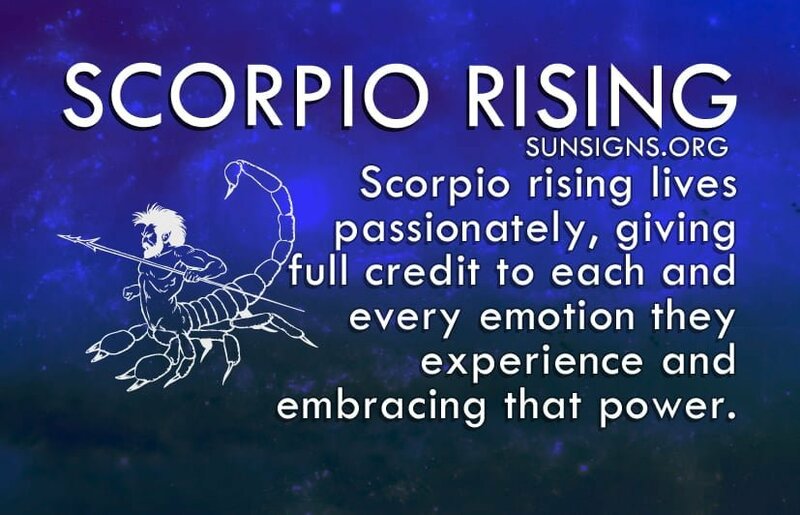 Scorpio rising lives passionately, giving full credit to each and every emotion they experience. Scorpio ascendant sign in astrology embrace the power of their emotions. That’s what drives them. This zodiac sign does nothing half-heartedly. It instead charges through life, at full speed ahead, with an resolute commitment and passion. If not so inclined or convinced, it instead does nothing. This rising sign actually is all or nothing. There is no middle ground with a Scorpio rising. And their commanding presence demands your respect. That being said, don’t even bother trying to fool a Scorpio ascendant person. They will figure you out soon enough. They have the desire to get to the bottom of everything and they will. This zodiac sign is determined to the point of obsession. They were born to see between the lines. Superficiality and facades are tossed aside upon first glance. They question everything and play the facts, the images, and feelings over and over again in their heads until they come to the right conclusion. Yet all of these investigations are often done behind closed doors. Scorpio ascendants are very private people and extremely secretive. It’s another demand they put on those around them. They will not allow others to trespass on their lives, nor their emotions. They are very protective of their emotions, even within themselves. (Read more about the Scorpio man to know better). They have the tendency to bottle their emotions until one day they simply explode. Now, this could be either tears of joy, bursts of laughter, or objects hurled in a fit of rage. That depends on that particular Scorpio rising sign. Although in many ways, this pent-up emotion serves as the perfect catalyst for people with ascendant in Scorpio in their horoscope. It evokes immediate change within themselves and often inspires others. Life to the Scorpio ascendant is one of trials and tribulations, challenges that in turn cause transformation, a powerful metamorphosis, if you will. So they often see these bursts of emotion as good in their lives, in place of something negative. They are expressions of power that then lead them to develop more power over their lives. It’s a win-win for this star sign. As Mars is the ruling planet for the Scorpio ascendant, your face shows the aggressive person that you are. With average height, you are usually stout or have a broad body frame. Your penetrating eyes might be the most prominent features that attract people with their wisdom. The Scorpio ascendant insist on commitment from themselves and their partners. It’s the same all-or-none approach they apply to their lives that they expect in their relationships. Scorpio rising is steadfastly loyal and unwavering, also making them stubborn to a fault and jealous, as well. They must have a stable and loyal partner. If their spouse is lying or even just not completely honest about one of these, they will know. Scorpio rising has an uncanny sense of perception. When Scorpio rising has been wronged, watch out. They will fight back with an unmatched viciousness, using anything they can get their hands on to seek their revenge. Power is a very important characteristic for Scorpio ascendant. They need it. They crave it. Not always so forthcoming, they often like to control from behind the scenes, subtly asserting their dominance. And this ascendant sign have the tendency to dominate. They can become power hungry when given the opportunity, which might come easily considering they are quite good at organizing and leading. Everything considered, in a Scorpio rising, you will find a devout partner, friend and colleague with an unparalleled enthusiasm for all that life has to offer. True and unwavering, this zodiac sign sticks around through thick and thin.